We describe three new species of minute salamanders, genus Thorius, from the Sierra Madre del Sur of Oaxaca, Mexico. Until now only a single species, T. minutissimus, has been reported from this region, although molecular data have long shown extensive genetic differentiation among geographically disjunct populations. Adult Thorius pinicola sp. nov., T. longicaudus sp. nov., and T. tlaxiacus sp. nov. are larger than T. minutissimus and possess elliptical rather than oval nostrils; T. pinicola and T. longicaudus also have longer tails. All three new species occur west of the range of T. minutissimus, which has the easternmost distribution of any member of the genus. The new species are distinguished from each other and from other named Thorius in Oaxaca by a combination of adult body size, external morphology and osteology, and by protein characters (allozymes) and differences in DNA sequences. In addition, we redescribe T. minutissimus and a related species, T. narisovalis, to further clarify the taxonomic status of Oaxacan populations and to facilitate future studies of the remaining genetically differentiated Thorius that cannot be satisfactorily assigned to any named species. Populations of all five species considered here appear to have declined dramatically over the last one or two decades and live specimens are difficult to find in nature. Thorius may be the most endangered genus of amphibians in the world. All species may go extinct before the end of this century. This adult female specimen, the holotype, was collected from pine-oak forest along Mexico Hwy. 131, 19 km S by road of Sola de Vega, Oaxaca, Mexico by J.F. Lynch, D.B.Wake and T.J. Papenfuss on 18 November 1974. 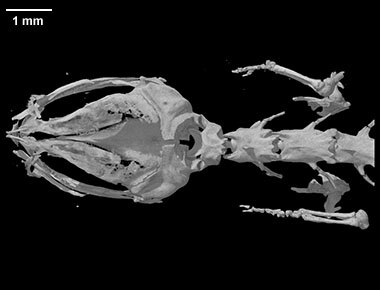 It was made available to the University of Texas High-Resolution X-ray CT Facility for scanning by Dr. David Wake of the University of California Museum of Zoology and Dr. James Hanken of Harvard University. Funding was provided by Dr. Hanken. This specimen was scanned by Jessie Maisano on 8-9 June 2011 along the coronal axis for a total of 12,387 slices with a resolution of 5.29 microns. The first 1521 slices were used to render the upper body. Campbell, J. A., E. D. Brodie, Jr., O. Flores-Villela, and E. N. Smith. 2014. A fourth species of minute salamander (Thorius: Plethodontidae) from the Sierra Madre del Sur of Guerrero, Mexico. South American Journal of Herpetology 9:46–51. Cope, E. D. 1869. A review of the species of the Plethodontidae and Desmognathidae. Proceedings of the Academy of Natural Sciences of Philadelphia 1869:93–118. Darda, D. M. 1994. Allozyme variation and morphological evolution among Mexican salamanders of the genus Chiropterotriton (Caudata: Plethodontidae). Herpetologica 50:164-187. Frost, D. R., T. Grant, J. Faivovich, R. H. Bain, A. Haas, C. F. B. Haddad, R. O. de Sá, A. Channing, M. Wilkinson, S. C. Donnellan, C. J. Raxworthy, J. A. Campbell, B. L. Blotto, P. Moler R. C. Drewes, R. A Nussbaum, J. D. Lynch, D. M. Green, and W. C. Wheeler. 2006. The amphibian tree of life. Bulletin of the American Museum of Natural History 297:1–370. Good, D. R., and D. B. Wake. 1993. Systematic studies of the Costa Rican moss salamanders, genus Nototriton, with descriptions of three new species. Herpetological Monographs 7:131–159. Hanken, J. 1980. Morphological and Genetic Investigations of Miniaturization in Salamanders (Genus Thorius). Ph.D. Dissertation, University of California, Berkeley, California, U.S.A.
Hanken, J. 1982. Appendicular skeletal morphology in minute salamanders, genus Thorius (Amphibia: Plethodontidae): growth regulation, adult size determination, and natural variation. Journal of Morphology 174:57–77. Hanken, J. 1983a. Genetic variation in a dwarfed lineage, the Mexican salamander genus Thorius (Amphibia: Plethodontidae): taxonomic, ecologic, and evolutionary implications. Copeia 1983:1051–1073. Hanken, J. 1983b. Miniaturization and its effects on cranial morphology in plethodontid salamanders, genus Thorius (Amphibia: Plethodontidae): II. The fate of the brain and sense organs and their role in skull morphogenesis and evolution. Journal of Morphology 177:255–268. Hanken, J. 1984. Miniaturization and its effects on cranial morphology in plethodontid salamanders, genus Thorius (Amphibia: Plethodontidae). I. Osteological variation. Biological Journal of the Linnean Society 23:55–75. Hanken, J. 1985. Morphological novelty in the limb skeleton accompanies miniaturization in salamanders. Science 229:871–874. Hanken, J., and D. B. Wake. 1994. Five new species of minute salamanders, genus Thorius (Caudata: Plethodontidae), from northern Oaxaca, México. Copeia 1994:573–590. Hanken, J., and D. B. Wake. 1998. Biology of tiny animals: systematics of the minute salamanders (Thorius: Plethodontidae) from Veracruz and Puebla, México, with descriptions of five new species. Copeia 1998:312–345. Hanken, J., and D. B. Wake. 2001. A seventh species of minute salamander (Thorius: Plethodontidae) from the Sierra de Juárez, Oaxaca, México. Herpetologica 57:515–523. Hanken, J., D. B. Wake, and H. L. Freeman. 1999. Three new species of minute salamanders (Thorius: Plethodontidae) from Guerrero, México, including the report of a novel dental polymorphism in urodeles. Copeia 1999:917–931. Klymkowsky, M. W., and J. Hanken. 1991. Whole-mount staining of Xenopus and other vertebrates. Methods in Cell Biology 36:419–441. Mueller, R. L., J. R. Macey, M. Jaekel, D. B. Wake, and J. L. Boore. 2004. Morphological homoplasy, life history evolution, and historical biogeography of plethodontid salamanders inferred from complete mitochondrial genomes. Proceedings of the National Academy of Sciences of the United States of America 101:13820–13825. Parra-Olea, G. 2003. Morphological and molecular diversification of the genus Chiropterotriton. Canadian Journal of Zoology 81:2048-2060. Parra-Olea, G., M. García-Paris, and D. B. Wake. 1999. Status of some populations of Mexican salamanders (Amphibia: Plethodontidae). Revista de Biología Tropical 47:217–223. Parra-Olea, G., M. García-Paris, and D. B. Wake. 2002. Phylogenetic relationships among the salamanders of the Bolitoglossa macrinii species group (Amphibia: Plethodontidae), with descriptions of two new species from Oaxaca, México. Journal of Herpetology 36:356–366. R Development Core Team. 2016. R: A language and environment for statistical computing. R Foundation for Statistical Computing, Vienna, Austria. ISBN 3-900051-07-0, URL http://www.R-project.org. Rovito, S. M., G. Parra-Olea, J. Hanken, R. Bonett, and D. B. Wake. 2013. Adaptive radiation in miniature: the minute salamanders of the Mexican highlands (Amphibia: Plethodontidae: Thorius). Biological Journal of the Linnean Society 109:622–643. Sabaj Pérez, M. H. (editor). 2013. Standard symbolic codes for institutional resource collections in herpetology and ichthyology: an Online Reference. Version 4.0 (28 June 2013). Electronically accessible at http://www.asih.org/, American Society of Ichthyologists and Herpetologists, Washington, DC. Shubin, N., D. B. Wake, and A. J. Crawford. 1995. Morphological variation in the limbs of Taricha granulosa (Caudata: Salamandridae): evolutionary and phylogenetic implications. Evolution 49:874–884. Taylor, E. H. 1940 “1939”. New salamanders from Mexico with a discussion of certain known forms. The University of Kansas Science Bulletin 26:407–439. Taylor, E. H. 1949. New or unusual Mexican amphibians. American Museum Novitates 1437:1–21. Venables W. N., and B. D. Ripley. 2002. Modern Applied Statistics with S, 4th ed. Springer, New York. Vieites, D. R., S. Nieto Román, M. H. Wake, and D. B. 2011. A multigenic perspective on phylogenetic relationships in the largest family of salamanders, the Plethodontidae. Molecular Phylogenetics and Evolution 59: 623–635. Wake, D. B., and P. Elias. 1983. New genera and a new species of Central American salamanders, with a review of the tropical genera (Amphibia, Caudata, Plethodontidae). Contributions in Science, Natural History Museum, Los Angeles County 345:1–19. Wake, D. B., S. M. Rovito, J. A. Maisano, and J. Hanken. 2012. Taxonomic status of the enigmatic salamander Cryptotriton adelos (Amphibia: Plethodontidae) from northern Oaxaca, Mexico, with observations on its skull and postcranial skeleton. Zootaxa 3579:67–70. Wiens, J. J., G. Parra-Olea, M. García-París, and D. B. Wake. 2007. Phylogenetic history explains elevational biodiversity patterns in tropical salamanders. Proceedings of the Royal Society B 274:919–928. Wiley, E. O. 1978. The Evolutionary Species Concept revisited. Systematic Biology 27: 17–26. To cite this page: Dr. Gabriela Parra-Olea, Sean M. Rovito, Mario García-París, Jessica A. Maisano, David B. Wake and James Hanken , 2016, "Thorius longicaudus" (On-line), Digital Morphology. Accessed April 25, 2019 at http://digimorph.org/specimens/Thorius_longicaudus/anterior/.